Welcome to the T-TRAK Wiki! Goal #1: We want to showcase completed T-TRAK modules with one or two photos of each. T-TRAK modules built by beginners, experts or in between are all welcome here. Club member pages (people pages) are included here primarily to tie the modules back to their creators. When you view a module you can use the 'Built by:' link to quickly find the owner's other works. Hopefully the pictures will inspire you to build your own modules and share some pictures here as well. Goal #2: Provide the most comprehensive and current list of T-TRAK clubs on the Web. The open cooperative nature of wikis means YOU can update any information on any page. You don't have to ask a webmaster to add a T-TRAK club, update a link or fix a typo. Just join and you can easily do it right now. There are currently 135 known T-TRAK clubs around the world. Check the CLUBS page for a list and a geographic map of club locations. 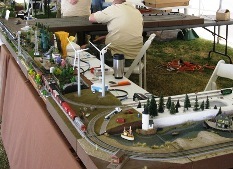 Goal #3: Grow the Model Railroading Hobby through T-TRAK standards. Perhaps you came here looking for a club in your area and there is not one (yet). Join the wiki and use it to START a club for the next person to find and contact you. There is no requirement to have an existing club website. As an alternative you can just add your name to the Seeking T-TRAK Friends page. By all means post pictures of your T-TRAK modules even if you are a 'club-of-one' at present. Goal #4: Make it easy to find the latest posted T-TRAK module photos. Whenever you return to visit this site, be sure to check the 'Recent Changes' tab at the top of the page. Next, check the box 'Files Changes' to filter the list of page changes to those with new pictures. Enjoy! Did you know The Boy Scouts of America have a merit badge for railroading? Making a T-TRAK module can help meet the badge requirements (plus requirements for Woodwork (4), Painting (3?, 4), and Electricity (11.e)). Learn more: T-TRAK Related Links. Shown above, many T-TRAK modules can be joined in different configurations to form a large layout. T-TRAK Modules (organized under respective clubs). Note: The best way to find the kind of modules you are looking for is to click on the Page Tags to the right. T-TRAK Clubs by Region, Country, Etc. Your T-TRAK club not listed? By all means, please add a page in this wiki and tell us a little about it. You may link to your T-TRAK club website if you have one. Even if you don't have any T-TRAK modules yet, or you don't belong to a club, you can create an account and configure it to notify you via email to changes to the entire T-TRAK Wiki or individual T-TRAK Wiki pages. An account also permits you to submit questions or comments. Before you join: Do you agree with our few simple House Rules? Join now. See button near top of right-hand navigation links. Members See who has already joined this site. Guidelines for Adding Modules and Club Members to Site. If you add some pages you may want to check this link to be sure you don't have issues.